Precook octopus in red wine with a little water. 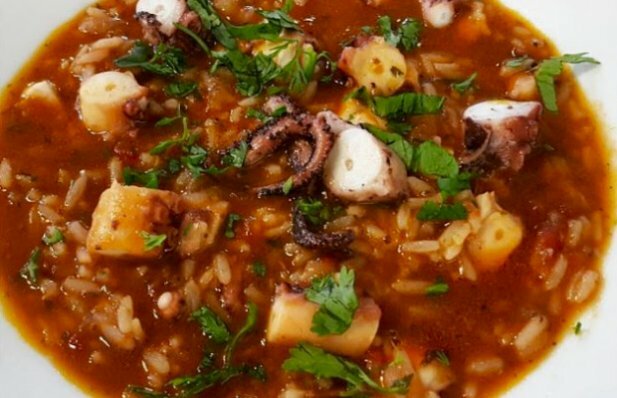 The octopus will exude liquid so that you are likely to end up with more cooking liquid at the end, keep this and add water to make it up to 2½ cups. Cut the drained octopus into small pieces. Heat the olive oil in a large saucepan and add the chopped onion and cook gently, stirring, for 2 or 3 minutes. Add the garlic, tomatoes, and chooped pepper, season with salt and pepper to taste and cook for a few minutes longer. Add the octopus and cooking liquid from the octopus and bring it to a boil. Add rice (preferably a short-grain) and bring back to a boil, then turn the heat very low and put the lid on the saucepan. After 15 minutes, stir to ensure the rice is not sticking to the bottom. After 5 minutes, taste the rice to make sure it is done. 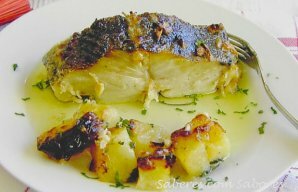 If you like cod, you will love this Portuguese roasted cod with milk recipe (receita de bacalhau assado com leite). Serve these grilled Portuguese horse mackerel (carapau grilhado) with a salad or some cooked vegetables. 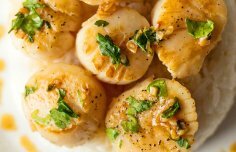 How to make Portuguese scallops.